Updated 18/11/18 to add in copies of presentations: for Muriel Bamblett and Fran Crowe. 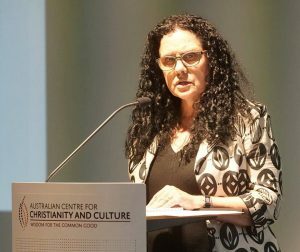 Muriel Bamblett presented the 2018 David Hunter Memorial Lecture, looking at how we can change the future for Aboriginal and Torres Strait Islander children in out-of-home care. As noted in the Family Matters Report 2017, Aboriginal and Torres Strait Islander children in the ACT are 12.5 times (nationally 9.8 times) more likely to be living in out-of-home care than non-Indigenous children. The focus of the lecture was on what can be done to change this. Selina Walker and Fran Crowe also provided personal reflections from their experiences. There was a lot of interest in the lecture. Over 90 people attended, with a number of ACT Government representatives, as well as members of the ACT Human Rights Commission; ACT Indigenous Elected Body; the Our Booris, Our Way Review committee; ACT Step Up program; Beryl Women Inc; ACTCOSS; senior regional staff from Foster Care and Permanency group and a number of interested community stakeholders and other parties. Rachel Stephen-Smith MLA, Minister for Aboriginal and Torres Strait Islander Affairs, met with Muriel before the lecture. In regards to the Our Booris, Our Way Review currently underway in the ACT, an interim report was released in August 2018. The opportunity to make a submission to this review is open for any interested person or group, with a guide on the website. The submission process is open until 7 January 2019. Below are some photos from the lecture. Aunty Agnes gave a very warm welcome to country. Aunty Agnes is a senior Ngunnawal elder and knew David Hunter personally. Her life and long contribution to the community is the covered in a video produced by the Tuggeranong Arts Centre. 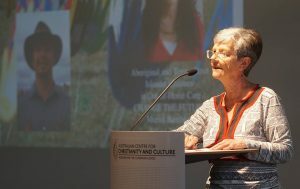 Muriel Bamblett was the key speaker and a copy of her presentation is available here. 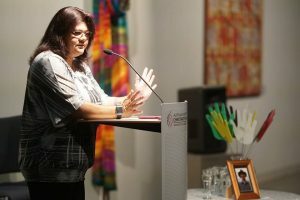 She is the Chief Executive Officer of the Victorian Aboriginal Child Care Agency (VACCA), the leading Aboriginal child and family welfare organisation in Victoria, protecting and promoting the rights of Aboriginal children and young people. Their programs and services reinforce Aboriginal culture and encourage best parenting practices, and they also advise government in relation to child abuse and neglect in the Aboriginal community. VACCA is a statewide Aboriginal community controlled organisation. They provide services premised on human rights, self-determination, cultural respect and safety. 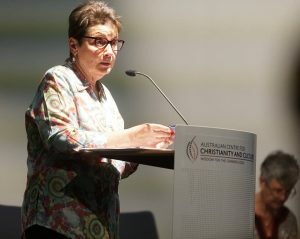 Selina Walter shared her experiences of out of home care in Canberra. Selina is the kinship carer of three children, and was named Barnardos Mother of the Year for ACT in 2017. Vivien Palmer read out a reflection from Fran Crowe, who was unable to attend in person but also wanted to share her experiences with out of home care in Canberra. A copy of her reflections is available here. Fran’s grandchildren attend the Smith Family homework club, where Vivien is one of the tutors. 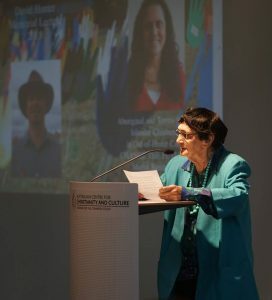 Janet Hunt, a long-time ANTaR ACT committee member and former chair or ANTaR National, brought the forum together as MC. Janet is the Interim Director of the Centre for Aboriginal Economic Policy Research at ANU.